In it’s ongoing drip feed of information the IDF have released pictures of various tools and equipment you might find on a large boat, which they have described as weapons. “The photos detail the way in which the Mavi Marmara rioters had prepared themselves to ambush IDF forces “ say the IDF. In it’s latest batch of photos they include a picture of a stack of what appear to be bullet proof vests. 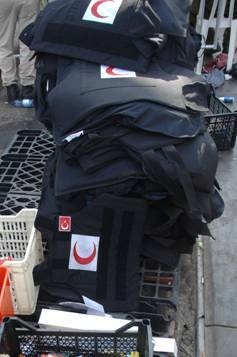 What they neglect to mention is that the vests bear the emblem of the Red Crescent, "the world’s largest humanitarian organization." The vests are no doubt intended to be used by aid workers in Gaza, due to the high risk of being shot by Israeli troops. Even more interesting, the photo of the bulletproof jackets bears a creation date of 2006-02-07 according to the EXIF data. (Not something I first spotted myself, but I’ve double checked it using my own software). I’m not saying you’re wrong, as I’m no camera expert, but I think it’s possible they just didn’t program the time and date settings correctly. I’d imagine if they were faking photographs they’d come up with something a little more incriminating than a few kitchen knives. All I’m saying is, it’s odd. All the other images bear a 2010 creation date, only the jackets image is 2006. Meanwhile, camera nerds may be interested to know the IDF favour Canon. Presumably, Hamas are Nikon fans.